Originally printed by Green Left Weekly (Australia). By Joel Cosgrove, Fightback member. 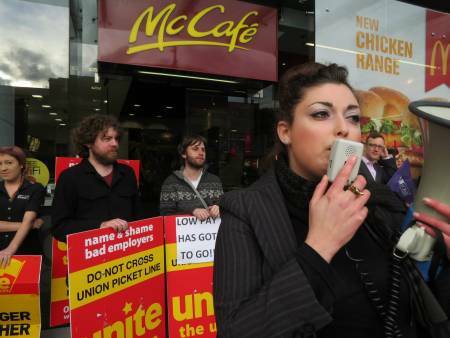 After a relatively quiet couple of years, the Unite union, which organises fast food and other previously unorganised sectors, has burst into action with a vigorous industrial campaign against McDonald’s. The key demands are focused around winning a NZ$15 starting wage, an end to casualised hours, a fair and transparent roster system and a number of union-only benefits, most of which have already been won by KFC Unite members. Unite gained national attention when it began its SupersizeMyPay.com campaign in 2005. The campaign focused on developing union membership in the fast food industry, as well as campaigning for a $12 minimum wage and an end to youth pay rates. The campaign achieved collective contracts in most of the major fast food chains ・ McDonalds’, Burger King (Hungry Jacks in Australia) and Restaurant Brands (KFC, Carls Jr, Starbucks, Pizza Hutt) for the first time since the end of compulsory unionism in the 1980s. This was not an easy or smooth process. There were lightning strikes, wildcat strikes and walkouts. There was more initial success at Restaurant Brands (especially KFC), where union density was higher and management resistance towards the union was less deep- set than at McDonald’s. McDonald’s have an international structure centred on McDonald’s HQ at Oak Brook, Illinois and “Hamburger University” — a 12,000 square metre complex. McDonald’s claims its “university” to be “the company’s global center of excellence for McDonald’s operations training and leadership development”, churning out 5000 graduates a year and claiming to have graduated more than 80,000 “students”. The role of the university is to centralise the company’s indoctrination process, building a consciously crafted global corporate culture. In New Zealand, this has been reflected in a culture of bullying, intimidation and anti-unionism that is spread through local operations. McDonald’s has never been willing to give an inch. Every win has been heavily fought for. The current dispute revolves around an offer of a $0.25 increase in all rates over a two year period. For those on starting rates, that is actually just the government mandated rise to the minimum wage. An even more extreme perspective is held by most franchisee owners, who have expressed a desire to not even have collective contracts. Unite has been building members numbers for several years now. The claims being put forward are being compared to the conditions already won by KFC workers. This example has been very useful to date in putting forward their example as a way forward for McDonald’s workers to begin the struggle for improved conditions. In light of the miserly offer from the company and hostility from franchisee owners, 85% of members voted in support of industrial action in a recent nationwide ballot. The process of starting this campaign has unearthed a raft of complaints and issues at McDonald’s nationwide. Most prominent was the revelation that union member Sean Bailey was told by a manager that “if you act gay on my shift, I will discipline you” and “if you turn anyone else in the store gay, I will punish you and make you lose your job”. Similar issues of bullying and harassment have come to light, including not being able to take breaks and not being paid for overtime. At a demonstration in Auckland with about 30 members and supporters, a large contingent of police arrived and roughly pushed away protesters who had been blocking access to an inner-city McDonald’s store. Police claimed the protesters were negatively affecting custom to the store, something the union stated was its right. In the furore over the issue, Unite members in McDonald’s and other fast food stores brought up the issue of police getting free or heavily discounted food. Although initially denied, a police spokesperson then scoffed at the idea that police could be “brought off” with burgers. McDonald’s said individual franchisee owners made the decision to give discounts to “emergency services workers”. This was shown to be an insultingly mockery of the truth when a union member supplied to media a photo showing a button titled “police promo” on their electronic tills. In the aftermath of these revelations, police officers provided anonymous statements about being disgusted at other officers’ taking these perks. Fast food workers came forward with similar stories and the police and police minister had to retract their statements from two days earlier. Union pickets in the South Island have been driven into by customers seemingly desperate for their cheeseburger fix. Overall though, members of the public have been supportive of the campaign. Therer have been very few attempts to break picket lines in Wellington recently and fewer still managing to get through. Pickets and protests have been marked by strong support from both pedestrians and passing vehicles. A Unite “war council” has been formed in Wellington to coordinate the protests and strikes. Auckland are holding a “McStrike Training Day” to build the skills, contacts and networking that is required to win. « Saturday night, June 1, Wellington – Fightback against McDonald’s!